In your home or office, the interior and exterior walls and siding can greatly affect your cell signal. Putting an antenna on the roof prevents the walls and siding from attenuating your cell signal and helps minimize the effect of other obstructions between you and the cell tower. For even greater cell signal improvement you can add an inline booster or building cell repeater (wireless) system. Antennas supporting 700Mhz LTE, 1700/2100 AWS and 2.5-2.7Ghz WiMAX Frequencies. 4G compatible antennas include portable, magnetic and permanent mount antennas. Choose from several kits that include an Antenna, and proper RF Adapter cable assemblies for use with Hotspots, USB Modems and Air Cards. Magnetic mount cell phone antennas are portable and improve the cell signal on any vehicle with a steel exterior. They work well on passenger cars, pickup trucks, SUVs, vans and can easily be moved from one vehicle to another. Glass mount cell phone antennas attach to the single-pane glass of your vehicle. They require no alterations to your vehicle but can't be easily moved from one vehicle to another. Not recommended for use with wireless vehicle repeaters. Permanent mount antennas include traditional NMO mount antennas and alternative P-Mount antennas. Permanent mount antennas generally outperform other types of antennas but do generally require drilling a hole in your vehicle or monitoring box. High gain directional and omni-directional antennas for use as donor rooftop mounted antennas in cell phone repeater applications for buildings, homes, offices and other fixed structures. Also used in direct connection applications for maximum signal. Marine Grade Omni Directional Cellular/PCS and VHF Antennas. Designed for marine applications including small boats, cabin cruisers, yachts and general freshwater and saltwater use. 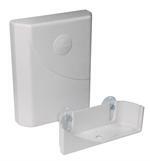 Designed specifically to connect to cellular repeater systems for wireless coverage in indoor applications, In Building Wireless Dual Band Cellular/PCS antennas are available in either dome style ceiling mount or wall/corner panel mount. Cellular Antenna Mounts including NMO, wall and mirror mounts for RV, Semi-Truck, Marine, Passenger Car and Building applications along with a the largest selection of Cellular Antenna Replacement parts including Whips and Re-Mounts kits. Popular cell phone antenna and signal booster choices for common applications as well as specialized situations such as remote monitoring, machine-to-machine, internet backup or any other application where a wireless cellular modem is used. Antennas supporting AT&T 3G MicroCell, Sprint Airwave, T-Mobile HotSpot @Home, Verizon Network Extenders and other Femtocell technologies. Cell phone antenna which works great on small boats, cabin cruisers, yachts. One of our highest gain, omni-directional multi-band cell phone antenna. Digital Antennas new wide band bullet antenna covers 695-3000 MHz and provides excellent performance from LTE to WiMax in a compact design. This new patent pending 4G antenna solution is manufactured to be rugged and dependable. Dual Antenna Expansion Kit (Includes: 311155 - Wall Mount Panel Antenna 700-2700 MHz 75 Ohm Directional (qty. 2), 859994 - 75 Ohm 3 port 700-2700 MHz Splitter w/F Female connectors, 951150 - 50 ft. RG11 Cable with F Connectors (qty. 2), 951127 - 2 ft.
700-2700 MHz. 75 Ohm Wide-Band 11.4 Inch Outdoor Directional Antenna for Cell Phone Signal Boosters with F-Female Connector. Includes Mounting Hardware. Wide-band weather proof panel antenna for use as exterior antenna in Amplifier/Repeater/BDA Systems. Powerful cell phone antenna, requires NMO mount. Typically installed through-the-roof. 3 dB Gain, No Ground Plane Elevated Feed, Cellular/PCS Dual Band Antenna. 3/8-24 ferrule stud adaptable to standard mirror bracket mounts, side-body mounts and shock springs. 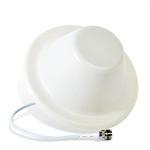 Wide-band 4G dome ceiling mount antenna for use as an interior antenna in Amplifier/Repeater/BDA Systems. Dual-band panel antenna for interior use as a donor antenna in Amplifier/Repeater/BDA Systems. High gain yagi directional cell phone antenna - for 1900MHz PCS only.